Just as we need to feed our natural bodies with wholesome food, we must nourish our spirit with the daily bread of The Word of God. I happened to be in a financial wilderness season when those kinds of judgmental thoughts ran through my head. At that time, I was having trouble putting food on the table for my two young children, my husband, and myself. I didn’t have the budget to buy healthy food, much less the time to actually prepare it from scratch. But over the course of a few years, the Lord has brought us out of that dessert place and into a season of abundance. Through this journey, He’s been sharing with me the gift that He intended our food to be. I’m so thankful for how He has helped me heal and strengthen my body by putting things into it that are healthy and whole. And I’m simply amazed at how God has made it possible for us to thrive by eating the pure, whole things that He has provided in His creation. Blessed by what He has given me, like a good meal, I’ve had the urge to share it with others. Thus my sort of informal food blog on social media! And the more I’m learning about food and its connection to health and wellness, I can’t help but notice all of the parallels between the natural food we put into our physical bodies and what we feed our spiritual bodies. So, now that the table is set, let’s dig into this dish, shall we? When we try to satiate our cravings with junk food, we find ourselves lethargic, overweight, and unhealthy. However, when we cut out the junk, our taste buds change. Instead of grabbing a candy bar, we reach for a piece of fresh fruit or a handful of ripe berries. And once again, we can appreciate the natural sweetness that God designed. When we’re not gorging ourselves on empty calorie foods, our appetite changes as well. We begin to crave the good, whole, pure foods that God created to fuel our natural bodies. And when we eat the right things, we feel better, get leaner, grow stronger, and have more energy. We’re more alive. And the same holds true for our inner spirit. In this fallen world, many have confused earthly pleasures with spiritual fulfillment. This brings to mind the heartbreaking story of a world-renowned chef who recently committed suicide. He hosted a very popular television show where he traveled the world in search of unique and delicious cuisine. In each episode, he found himself in some of the most beautiful places on earth, enjoying what looked to be some of the most delectable delicacies under the sun. But there was a palpable sadness, loneliness, and disillusionment to the way he approached his experiences. Until our spirit is filled with Christ, our appetite for things of the world will only grow but never be fulfilled. Without the Lord, and His Word, we can have all the choicest foods in the world, and still experience spiritual starvation. 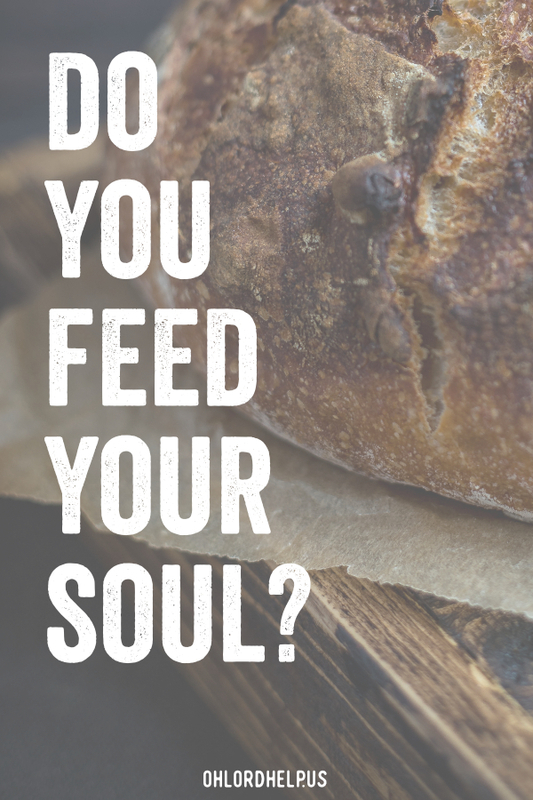 So, if we don’t want to starve, what should we feed our spirit? First, we have to choose to leave behind the lusts of the flesh. This can be challenging in a world that constantly appeals to our sinful appetite. When we crave and binge on worldly “entertainment,” we quench an unwholesome spiritual appetite. Shows, movies, and music that are filled with filthy language, terrifying scenes, sexual immorality, and the like, fill our spirit with sinful desires. Desires that draw us back into our flesh and pull us further away from Christ. Just as binging on junk food slowly deteriorates our physical health–eventually leading to sickness and death, indulging in sinful “entertainment,” steadily erodes our spiritual growth–eventually leading to spiritual death. On the other hand, when we feed our minds and hearts a healthy diet of good things, our spirit man gets filled to overflowing. We can relish scripture, taste sweet fellowship with loving family and friends, feast on messages that encourage our faith and drink in music that helps us draw closer to the Lord. 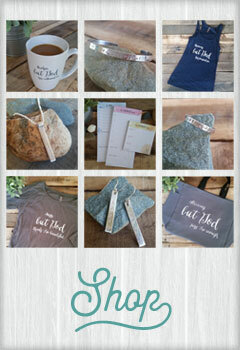 Beloved, when we draw our sustenance from our “daily bread”–which is the Word of God–we build up our spirit man. And just like with natural food, we can’t expect to feel full if we eat only once a week. To maintain our physical strength, we must eat multiple times throughout the day. So too with our daily bread. We must feed on the Word daily and pray continually. 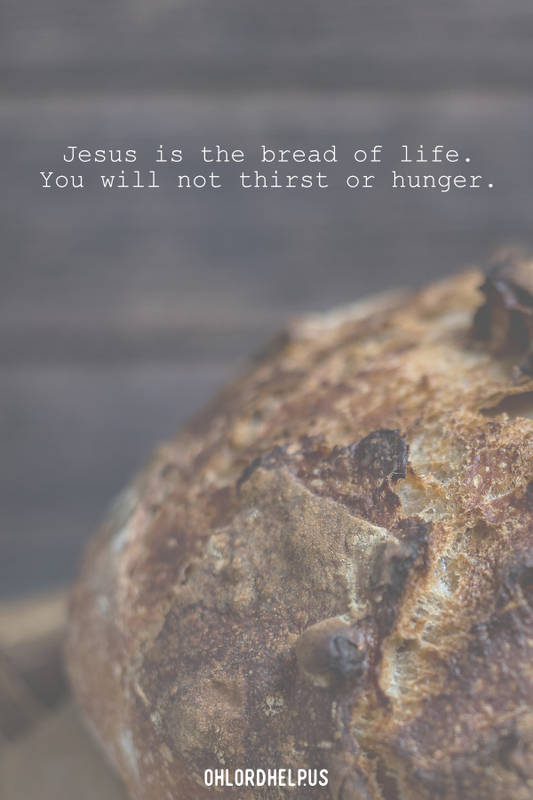 When we have the Bread of Life, Jesus, living in our hearts and minds, we will have the strength we need to walk this straight and narrow path of faith. What kind of diet do you feed your body and your spirit? Have you feasted on your daily bread of the Word today? All scripture references from The King James Version of The Bible. I love to create beauty, especially from broken things. 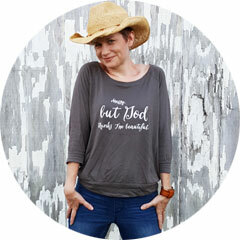 Whether it's writing and singing a song about a season that about broke my spirit, making a new piece of jewelry from old castaways, or writing a vignette about painful memories that the Lord has redeemed-- it's a gift to get to create and share expressions of beauty and restoration. I hope to encourage and inspire others to see the broken pieces in their own lives not as refuse to be discarded, but as fodder for something new. I'm blessed to be a wife to one, a mama to two, and a daughter of the Most High!